The immediate difference between those two was the cost. Even today, the Hero3+ Silver still fetches around $260, while the Yi HD is less than a third of that price. The other big difference was that the Yi HD lacked one pretty major feature, an LCD screen. The lack of an LCD no doubt contributed greatly to the drastic price difference and while slightly annoying, the WiFi control from a phone is pretty reliable, at least on Android. It’s good on iOS, too, but it’s not quite as responsive, even on the latest iPhone SE. The new Yi 4K gives us a 2.19″ LCD, and it’s a touchscreen. While the price at $249 is significantly more than the Yi HD’s $82, it does shoot 4K video, and still comes in at only a little over half the price of the GoPro Hero4 Black, which is currently $449 through Amazon. The Yi 4K also comes with a newer higher capacity battery, boasting 2 hours of recording time, which is double what I’ve experienced with my Yi HD camera (I usually get a few minutes over an hour on a full battery shooting 1080p24). 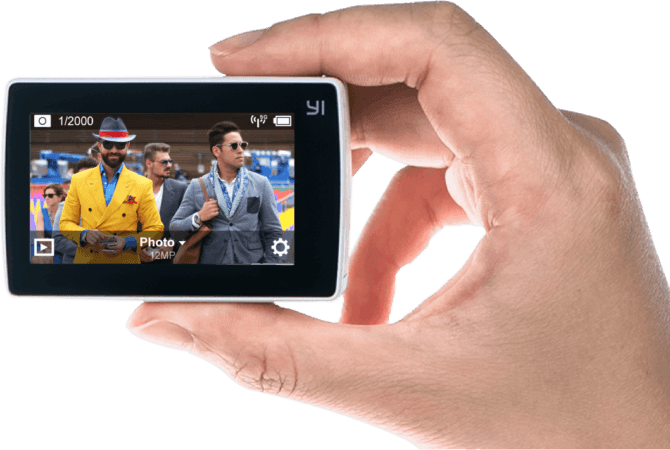 The Yi 4K shoots 4K video at 30fps at 60mbps, 1440p at 60fps, 1080p at 120fps and 720p at 240fps, bringing it about in line with the GoPro Hero4 Black. It also features a built in 3-axis acceleromoter and a 3-axis gyroscope which provides image stabilisation, a very welcome addition. To top things off, they’ve also given full manual control over the shutter speed, ISO, white balance (the lack of which being my only personal complaint about the Yi HD). There is a side-by-side comparison between the two over on the Yi website (it’s way down at the bottom), but it will be interesting to see how they compare in the real world, and if this camera can be hacked as much as the original Yi HD (or if it even needs to be). The Yi 4K is available in black, white or “rose gold” (aka pink), but only the black & white versions seem to be available on Amazon at the moment. I have one on the way to me at the moment, so as soon as it arrives, I’ll be putting it through its paces and see how it handles, both in terms of durability and the quality of the footage it shoots. So, keep an eye out for a full review and some sample footage coming soon. The Yi HD 1080p camera has impressed me very much, so I have high hopes for the new 4K version. What action camera do you use, if you have one? Do you have one of the Yi HD or 4K cameras? What do you like or hate about them? Let us know in the comments. Update: A previous version of this article attributed the camera to Xiaomi. It is actually made by Yi Technology and the post has been updated to reflect this. I own GoPro Silver, Black, Session, JVC Addixion, Mokacam, and Olympus Tracker TG their newest model. The Yi Camera blows them all away. The build quality of the camera is exceptional and smacks of Sony, Canon, or any other High End Brand Quality. The fact that the screen is built into the tiny form factor is fantastic and extremely convenient. The addition of the ability to attach your Tripod or any other device without a special attachment reduces bulk and size. The image quality for Video and Photos is great and the Menu system is very easy to navigate without an MIT Technology Degree. This should not be compared in any way shape or form to any Asian Knock Off Action Camera. Yi Technology has done its homework and taken the shortcomings and other design differences of other products and fixed them. The fact that the battery lasts twice as long as before and this is a 4K camera is fantastic. The build quality is superb and the attention to detail is amazing. If you don’t have a Selfie Stick or a Bluetooth Controller I recommend purchasing the Kit on Amazon which includes the Yi 4K Camera and the Bluetooth Controller and Selfie Stick. The Selfie stick is solid and well made and easily worth $50 on its own and the Bluetooth Controller is solid and not flimsy like other products on the market. For a difference of $30 its a great value. I totally recommend this product. If you like to have 4K or 2K sports camera in different price, you can check in Chinavasion. Different brand of sports camera you can find from China.